Easter Lilies are pretty, smell good and get us thinking of Spring. We love to adorn our homes with them at Easter Time. Unfortunately, these plants can be deadly to cats. Even the smallest piece of leaf or flower will cause severe, sudden (acute) renal (kidney) failure. 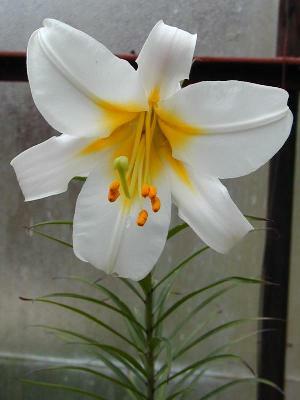 All members of the Lilium genus (family) are toxic. All members of the Hemerocallis genus (common Daylily are also toxic. Peace Lilies, are not true lilies and are not toxic. Cats that are sick from eating Easter Lilies will have gastrointestinal (stomach) signs such as vomiting, nausea (which will sometimes cause drooling) within hours. Acute kidney failure can develop within the next 5 days. PLEASE BRING YOUR CAT IMMEDIATELY TO THE HOSPITAL IF YOU EVEN THINK THEY HAVE EATEN EASTER LILY! If we are not available then consult the instructions under Emergencies and take them to the emergency hospital immediately. Immediate treatment consists of aggressive gastrointestinal de-toxification, if caught soon enough - within 6-8 hours. Intravenous fluids are also started immediately and continued aggressively. If treatment is delayed longer than this then chewing on or eating of the Lily plant almost always results in Acute Renal Failure. Death is a very real and tragic outcome if treatment is not sought soon enough and not conducted aggressively enough. A wait-and-see approach will cost your cat its life! Please contact us if you have any questions or to set up an appointment.